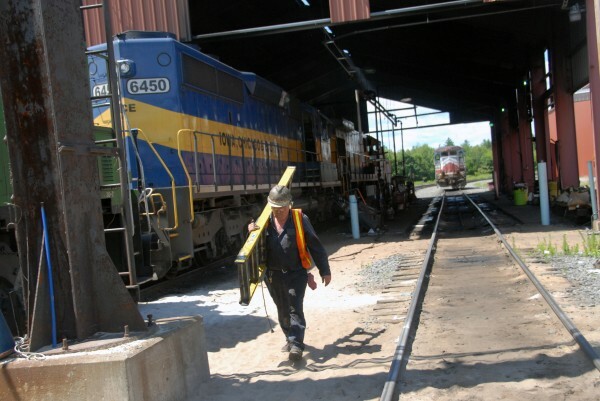 Montreal, Maine & Atlantic Railways worker David Black helped repair and test several locomotives in the company rail yard in Derby Maine on Saturday, July 21, 2012. 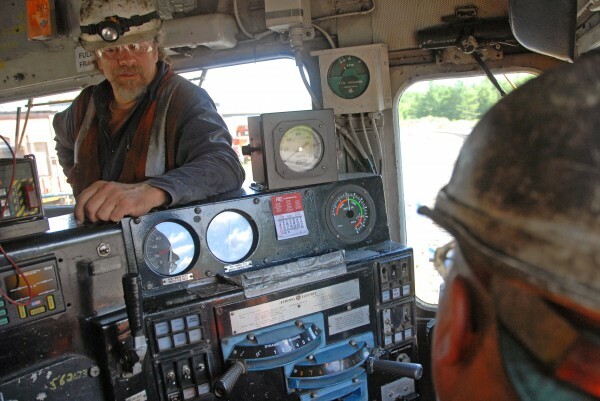 Montreal, Maine & Atlantic Railways workers Tom Stupakewicz (left) and David Black confer aboard a locomotive in the company rail yard in Derby Maine on Saturday, July 21, 2012. DERBY, Maine — A few years ago, Tim Scalia was worried that he would lose his job to a slumping rail freight market. Now he worries about having enough time to get the job done. The chief mechanical officer at Montreal, Maine & Atlantic Railways, Inc. said the company will have eight more locomotives added to its complement of 29 by the end of the year to handle a 5 to 6 percent increase in traffic that the freight rail service, one of Maine’s largest, has handled over the last several months. “There was a really hard stretch there the last couple of years. Now business is improving. We have put more assets out there and it’s going to be good,” Scalia said Saturday at the company’s mechanical facility on BNA Avenue. The railroad expects to increase its freight schedule from three to six days weekly within the next several weeks and has nine new hires on the job or in training, said CEO Robert Grindrod, whose Hermon-based company employs about 175 workers. The bad news continued until 2010. Facing annual losses of $4 million to $5 million, the company was forced to sell about 240 miles of railroad tracks it owned in northern Penobscot and Aroostook counties to the state for $20.1 million. Montreal, Maine & Atlantic could no longer afford to maintain the tracks, which had fallen into poor condition. State leaders bought them because the loss of the line would have been disastrous for northern Maine manufacturers. Track repairs should finish this summer as part of a $10.5 million project overseen by the Maine Department of Transportation. “The hard part of the last several years was dealing with the mills’ reduced traffic. Revenue wasn’t at expectations, which dropped morale with the employees,” Scalia said. The loss of the 240 miles of tracks forced the rail line to concentrate on building its customer base on another 500 miles of track it owns between Bangor, Brownville Junction, East Millinocket, Searsport and into Canada almost to Montreal, Grindrod said. The traffic increase comes from several sources, Grindrod said. Auto manufacturers in and around Detroit have increased shipments to a regional distribution center in St. John, New Brunswick. Kia Motors also is shipping more vehicles from the West Coast to St. John, he said. The best news for the rail freighter, Grindrod said, is how it is getting a lot of new business shipping petroleum products from new or expanded oil fields in North Dakota and Saskatchewan to Irving Oil. He is hopeful that this work will continue to increase. “It is a lot of business and it produces a lot of revenue,” he said. Manufacturers in Maine and Canada also seem to be doing better, Grindrod said, particularly Tafisa Canada, one of North America’s largest manufacturers of particle board used to make furniture and kitchen cabinets. Occasional large shipments of windmill parts to Searsport also have helped, Grindrod said. Scalia plans to come to work for parts of next week, when he is supposed to be vacationing, to ensure that the locomotive rebuilding project stays on schedule. Three of the locomotives will be additions to the company’s stock. They’re not new machines, but new enough: General Electric C 39-8s built in 1986 that the company bought and will have rebuilt with reconditioned engines, generators and other key components, Grindrod said. The rest will be older models that the freight company took out of circulation when they broke down, Grindrod said. Scalia also has to work on finding more workers. The company has rehired all of the people available now who were laid off from MM&A years ago. The rest still in the area work for other rail companies or have left the industry, he said. The training of new workers can take up to three years to complete, and Scalia worries that the company’s workload might leave the company scrambling for experienced help. The rail service has to find a way to pay for the repairs of about $500,000 worth of damage done to its track in Brownville, which was wrecked by a brutal line of thunderstorms that hit the area last month, but Grindrod said he is optimistic about his company’s future. He hopes to see a lot more business if the new torrefied wood facility being developed in Millinocket gets its permits and starts shipping product by rail to Searsport and from there to the United Kingdom next year. The permit process is under way.